Whether you are a web designer or graphic designer, finding royalty free images for your projects is really difficult. It may take a huge part of the entire time you allocate for a project if you don’t know where to search for them. In this post, we list the best 10 websites where you can find free images. When I use the word free in this post, it means two things. The images that you can use without any restrictions have Public Domain licenses. It means nobody owns that piece of art and anyone can do whatever they want with that piece of art. Whoever created that piece of art, dedicate them to the public. These products can be used for personal as well as commercial uses without any restriction. Most common Public Domain license is CC0. CC stands of Creative Commons which is not for profit organization based in the US. They also offer several other licenses. Images licensed under CC0 have least restrictions. There is CC1.0 license which comes with a small restriction for the users. 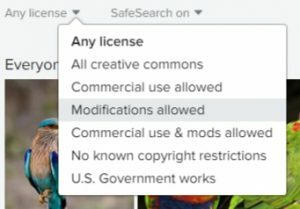 You can use images licensed under CC0 in any way you want. The creator made it public, and he or she doesn’t have any control authorship on it. The actual terms may vary based on the copyright laws in each country. So, here is the list of top websites offering public domain images which you can use anyway you want. The most popular place people find images is Google Image Search. I used to search images here when I was a student. I was not concerned about the license and copyright of the images at that time. I think some of you also might have done or is doing so. Later I came to know that we can filter the images with a free license in Google Image Search. It was an aha moment for me. Some of the best photos in the Google Image Search will be disappeared when you activate the filter for free images that can be used commercially. However, this is still a great way to find out suitable images. If you don’t know how to filter the free images in Google Search, please follow the instructions below. Step 1: Open Google and search for the image you want. Step 2: Click on the “Tools” option on the option bar below the search bar. Step 3: Click on the “Usage rights” parameter on the “Tools” option. Step 4: Choose the “Labeled for reuse” option from the different values you get in the drop down. Voila! Your results are now filtered and you can choose any image you want from the results without worrying about the copyrights. Alternatively, you can also filter the images using the advanced search setting option in Google. The quality of the photos on this website is amazing. Unsplash has a great community who regularly contribute free stock images. Unsplash members can like the photos, mark as favorite, and follow the contributors. One unique thing about the Unsplash is that they provide an extension called Unsplash Instant for the Chrome web browser which will add beautiful images randomly as the background of each tab you open on the Chrome. This is one of my favorite website for free stock images. It has a fast-growing community, and the number of images is increasing day by day. Similar to Unsplash, you can like photos, mark as favorite and follow contributors. The native Pexels app for Mac and Windows computers helps users to access the entire library of free stock photos and videos. Your information in the Pexels accounts will be synced across the app and regular website. This Photoshop plugin can improve the workflow of the designers. We can access the whole library of free photos in Photoshop. The plugin will add a small palette/window (similar to any palette on the Photoshop) on the Photoshop where we can search and find images. When we click the images, it is automatically added to the Photoshop document or canvas. Pexels’ WordPress plugin allows users to find images without leaving WordPress dashboard. We can find the photos and download them to the WordPress Media Library. This is not an official app from Pexels, but they recommend it on their website. This add-on will help to find, download and use Pexels images in any MS Office application including Word and PowerPoint. My favorite feature of the Pexels is it allows us to find images based on the specific colors. When you open an image, Pexels will create a color palette of main colors on the image, and you can find it below the image. You can click any of the colors in the color palette, and you will get a bunch of images containing the same color. In that page, you will have more options on the color palette, and you can click any color to find more images. We can find the metadata of the photos on the website which is greatly helpful for graphic designers. The details like the camera used, aperture value, ISO and focal length will help designers when they want to use the image for image composition. Pexels doesn’t provide shutter speed, but that is not important. As a full-time web designer, I will need illustrations and vector graphics for the websites I create. Pixabay is my favorite website to find them. The library of Pixabay contains more than 1.4 million free stock images and videos, and the best thing about Pixabay is that they offer illustrations, vector graphics, and videos. Pixabay also provides the metadata of the photos like the camera uses, aperture value, ISO, the focal length of the lens and shutter speed. This is a subdomain of Pixabay.com which offers lots of JQuery plugins, extension, add-ons and many other free products. You must check out this website if you are a web designer. The following are some of the best items available in the Pixabay Goodies. This WordPress plugin allows users to add images to the posts and pages using the “Add Media” button in the Editor. We can filter images by photos, illustrations or clip art. We can also filter the images based on orientation (portrait or landscape). We can also download the images directly to the Media Library to use them later. You can create beautiful image galleries on your website using this amazing WordPress widget. This extension allows us to access Pixabay library easily. This extension will display random images from the Pixabay as background images for every new tab opened in Chrome. If you are a Notepad++ fan, this plugin will be very helpful for you to pick colors and find HSB or RGB values of them. Pixabay allows us to browser images clicked by the certain camera. You can pick a camera model from the list, and you can pull out all the photos taken by that camera. I am not sure how this can be useful, but it is a nice feature to have. This website is less popular, and varieties are limited. The database of PICNOI mainly contains images of people. Currently, the community is very small, and number photos are very less compared to other websites in this list. However, you will get great photos of people on this website. So, don’t forget to check out this website when you need portraits and photos of individuals or group of people. This is a small website created by Jeffery Betts, a UI/UX designer from the US. He offers a few hundred images and a couple videos under Creative Commons license. You can find photos and videos of nature, flowers, cityscape, office, and tech. He also has a great collection of macro photography. Jeffery says he has taken countless photos and videos and wanted to share some of them with people. This is a great source for getting unique or rare photos. The quality of the photos on these websites is less compared to the images on other websites. You can find rare niche images in categories like science, engineering, and space, etc. This is another awesome website which provides images without any copyright restriction. It contains amazing photos in many different common categories. This is a growing community, and hundreds of new images are added to this website every week. This is another cool website where you don’t have to worry about the copyright issues at all. Flickr is a great source for photos under a variety of licenses including CC0 and CC1.0. If you want to use the images for the commercial purposes or for your clients, you need to filter the images that can be used for commercially. You can also find great photos which you can use any way you want but require attribution. It is better you check out different licenses used in Flickr and find images based on that. No Known Copyright licensed images can be used anyway. These are the images that nobody owns the copyright, or the owners don’t care about the copyright. This is a small website with around 3000 thousand vintage drawing, illustrations, and artworks. It can be very difficult to drawing and artworks with a Public Domain license. That is why I included this website in this list. There are images under so many categories. If you need a drawing or artwork for free, Reusable Arts may be the perfect website for you. There are so many other websites which provide free public domain images. But for now, this will be enough for you. I hope these websites will help you to get high-quality stock images for free. I highly recommend you to make donations to the creators of these images if you find them useful. This way you can recognize the hard work of those photographers or designers and cheer them for their amazing work for the public. There are options to donate to the contributor in some websites like Pixabay and Pexels.